The house at Windsor Forest, West Coast Demerara on fire. 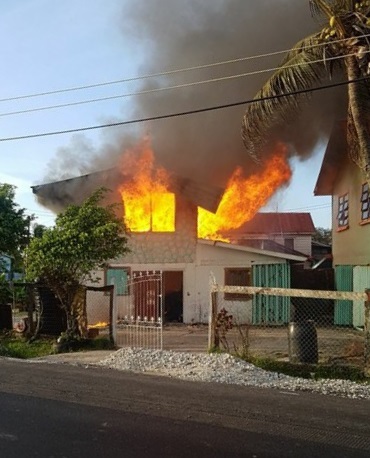 Fire early Thursday morning destroyed a house at La Jalousie, West Coast Demerara, bring to four the number of houses that have been destroyed in one week. West Demerara Divisional Commander, Assistant Commissioner, Leslie James initially said a child might have been injured, but he later said that was not so based on information he collected during his visit to the scene. James said the blaze occurred at about 6:15 AM, seemingly of electrical origin at Lot 12 La Jalousie. The building is owned by Hazar Udeh who was not at home at the time of the fire. Those at home were his wife Nazeema Hamid, 33, and two children, Harfiena, 7 years, and Scarfiena, 1 yr 4 months. A second house located at Lot 12, La Jalousie was scorched on the eastern side. That building is owned by 39-year old Scheied Mohammed. James said two fire tenders responded at 6: 30 AM. This is the fourth house to have been destroyed by fire for the week. Two houses on Da Silva Street, Newtown, Georgetown were Tuesday night destroyed when an enraged man attacked his wife and set their house on fire which quickly spread to the other building. On Wednesday afternoon at 1892 Diamond Housing Scheme, a wooden house was burnt as a result of children playing with squibs that had been purchased to celebrate Diwali, the Hindu festival of lights.